On August 20th 1945, only 5 days after the surrender of the Imperial Japan, the first (black) market opened in Shinjuku. This Shinjuku Market was a community of open-air, primitive merchants. In following months, the similar black markets opened in many key locations around Tokyo and other major cities in Japan. The operator of such black markets were tekiya (a sort of mafia/yakuza which specializes in open-air markets (1)), who supplied various merchandise to those shops, provided the protection and controlled the prices. The Shinjuku Market was operated and protected by Kanto Ozu-Gumi, the Shinjuku local tekiya. Territorial conflicts among tekiyas have been subjects of many yakuza films in Japan from 1950s to 1970s. One of such films is “Showa Zankyoden (昭和残侠伝, Dir. Kiyoshi Saeki, 1965)“, which describes how these tekiyas operated black markets in the years immediately after the war. Because of this supplier/protection relationships, many shop owners depended on tekiya to continue their illegal racket. In one sense, this film is one of the earliest films to deal with “modern” yakuza (tekiya). “Modern”, in this case, means the corrosion of code of honor among yakuza members. Yakuza/tekiya was an operation based on strict master-subordinates relationship. The head of a gang was not only a director of the enterprise, but also acted as a paternal figure to those who followed him. Members of a gang have strict seniority system, brotherhood. The code of (pseudo)parenthood and (pseudo)brotherhood was one of the most favorite themes among Japanese genre writers, dramatists, and filmmakers. The hero has to break the code to save his love or his family and pays the price in the end. Or the hero revenges the corrupted brother who defied the code to satisfy his greed. Very primitive, but extremely effective melodrama. After the war, because of chaotic nature of the black market operation and sudden increase in semi-yakuza members, this relationship of honor slowly eroded. Or precisely speaking, the erosion of the code became the favorite topic among the writers and filmmakers (2). The most popular and influential “modern” yakuza film is “The Battles Without Honor and Humanity (仁義なき戦い, 1973)” by Kinji Fukasaku. This film, as bloody as it is, depicts ruthless nature of those gangs without honor. It is quite interesting the story starts precisely in these black markets in Hiroshima after the war. In “Drunken Angel”, preceding Fukasaku’s film by almost three decades, Kurosawa already pictures the loss of brotherhood among members under this profit-driven black market ventures. Even though Matsunaga is chased off from the position of black market operator partly because of his illness, in doing so, Okada and the Boss did not hesitate. The bloody duel between Matsunaga and Okada is least heroic. They drag themselves on floor, they don’t even try to stab each other in fear of being stabbed. This miserable, disgraceful duel would be reiterated and perfected in “Rashomon” a few years later. Crucial background omitted from the film is how Matsunaga became Yakuza/Tekiya in the first place. This part of the story might have been obscured in order to pass GHQ/SCAP censorship. In any case, contemporary audience must have recognized the type, so-called “après-guerre” criminals. In the years immediately after the war, many ex-soldiers, young generations who lost their moral ground, went down the hill, gathering around black markets and gambling rackets. They started to form criminal gangs, exploiting those who needed their protection. It must have been extremely difficult for those who had their remaining days numbered, to find their honorable cause were dumped like garbage and to let themselves survive. Especially, those who had been ready to go Kamikaze attacks were considered the most morally eroded, called “Kamikaze-kuzure”, meaning “ex-would-be-Kamikaze pilots who went to the dogs”. Matsunaga appears to be one of those violent après-guerre criminals, with little intent to find purpose of his life. The brilliance of the story lies in the contrast between sickness and violence. Matsunaga is searching for something honorable to justify his death, but TB does not give him one. He despises the sickness, not because he wants to live, but he does not understand the reason, or absence of it. Sickness is, in essence, arbitrary. You have little control over it, but doctors do. This further irritates Matsunaga, since somebody else, Dr. Sanada, has much power over his destiny. Dr. Sanada seems to look through Matsunaga’s tormented psyche and offers his help in his own way. In order to survive, Matsunaga would have to go through misery and humiliation, such as being damped by his girl, losing his power over black market, and rebuilding his moral. Yes, survival is tough. In a sense, this film is a close cousin of film noir in Hollywood of the same period. Many noirs deal with the war veterans who experience hard time re-fitting into the postwar society. In some cases, noir character is an amnesiac, who does not remember the past beyond the war. This dislocation in time caused by war creates the tension for the plot, culminating in the revelation at the end. 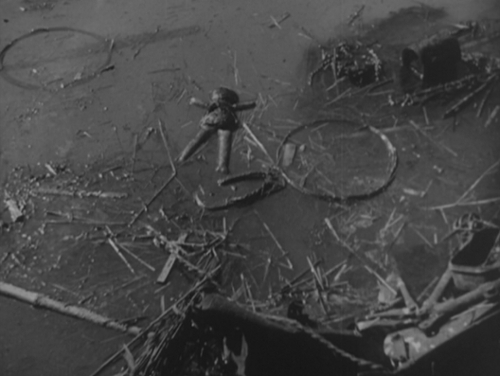 In many postwar Kurosawa films, and other Japanese films of this era in general, the past beyond the war is buried in deep subconscious, never let it loose again. Toshiro Mifune gives such a powerful performance as Matsunaga, creating the character as lively as it can be. During the war, he was a photographer attached to Kamikaze unit. He took photographs of those who were on the final one-way trip, just before the takeoff. I really don’t know how deeply this experience affected his acting as a result, but it is tempting to imagine as such. In Mifune, Kurosawa found a physique and a voice, which embody his romantic but ruthless view of the world. (1) In its origin, ‘tekiya’ which had been a group of street merchants controllers, differed from ‘yakuza’, which had been a group of gamblers. But in later years, their operation and organization become less distinct from each other and some of tekiya groups have become influential yakuza. (2) In reality, modernization of yakuza is transformation of guild-based group to profit-oriented enterprise. Prewar yakuza was descendant of guild of workers in male-oriented enterprise such as firefighters, dock workers etc. In contrast, many yakuza in postwar era formed modern companies in legitimate businesses as a front.